In very rare cases, Adaptive Highbeam Assist may fail to recognize other road users that have lights, or may recognize them too late. In this or similar situations, the automatic high-beam headlamps will not be deactivated or activated regardless. There is a risk of an accident. Always carefully observe the traffic conditions and switch off the high-beam headlamps in good time. 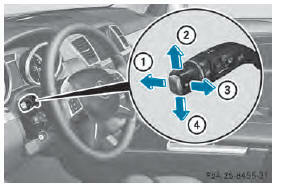 You can use this function to set the headlamps to change between low beam and high beam automatically. The system recognizes vehicles with their lights on, either approaching from the opposite direction or traveling in front of your vehicle, and consequently switches the headlamps from high beam to low beam. The system automatically adapts the lowbeam headlamp range depending on the distance to the other vehicle. Once the system no longer detects any other vehicles, it reactivates the high-beam headlamps. The system's optical sensor is located behind the windshield near the overhead control panel. ■ To activate: activate the Adaptive Highbeam Assist function using the onboard computer . ■ Turn the light switch to . ■ Press the combination switch beyond the pressure point in the direction of arrow 1 .
multifunction display lights up if it is dark and the light sensor activates the low-beam headlamps. If you are driving at speeds above approximately 28 mph (45 km/h): the headlamp range is set automatically depending on the distance between the vehicle and other road users. in the instrument cluster also lights up. indicator lamp in the multifunction display remains lit. ■ To deactivate: move the combination switch back to its normal position.